Photo courtesy of Kitchen Konfidance. We are now at the tail end of summer produce and about ready to switch over to fall flavors. Enjoy the last of this season with sweet cherries, fresh greens, crisp zucchini, and juicy peaches and nectarines. Cherries are like natures Sweetart candies, but if you don’t have a cherry pitter, handling these ruby gems can be quite difficult. For these recipes, try this no pitter needed method involving an empty wine bottle and a straw. Now that your cherries are pit-free, make these Cherry Yogurt Parfaits with Crunchy Granola. Eating one of these first thing practically ensures that your morning will start off on the right foot. Roasted Cherry Goat Cheese Crostini are a quick and easy appetizer that showcases this summer fruit. It might be a little untraditional to enjoy cherries in a savory application, but their sweet notes pair well with the salty and tangy goat cheese. For another savory spin, make this Cherry Orange Chicken Salad with Candied Walnuts. Tender chicken, sweet cherries, and crunchy walnuts get tucked between two slices of soft sandwich bread for one dreamy summer sandwich. When greens are at their peak, it is high time for a good salad. This Herby Nectarine and Avocado Little Gem Salad, is not your typical bowl of limp lettuce. It is filled with flavor thanks to the fresh nectarines and lively herbs. Croutons and cucumber lend crunch, while avocado and feta give that super satisfying bite. Greens can do more than just make a good salad. Take these Baked Falafel for example. Falafel are a Mediterranean fritter made from garbanzo beans and herbs, which are often served up in a soft pita. With crispy exteriors, soft centers, and loads of flavor, it is no wonder why they are a fan favorite. Another Mediterranean dish that is filled with fresh herbs is tabbouleh. Try this Quinoa Tabbouleh as a fresh summer side dish. It is full of parsley, fresh tomatoes, and bright lemon juice. Plus this salad can be whipped up in about 25 minutes, making it ideal for those last few lazy summer evenings. These Orange Chicken Lettuce Wraps are a great way to sneak some greens into a picky eater’s diet. They won’t even realize they are eating leafy greens when they are wrapped around this sticky sweet orange chicken filling. If you’ve never thought about starting off your day with zucchini, you’re not alone, but these Zucchini Bread Pancakes are about to change everything you thought you knew about breakfast. All the flavor of a slice of zucchini bread, in pillowy pancake form. Pass the maple syrup, please. This Summer Corn Chowder is the best of the season tucked into one bowl. Sweet corn, light zucchini, new potatoes, and crisp carrots meld together with smoky bacon and luscious cream to create one covetable bowl. If you find yourself with extra zucchini, make these Baked Zucchini Fries. If you don’t find yourself with extra zucchini, run, don’t walk, to the store and get some! These fries are coated in crispy panko breadcrumbs and then baked to golden perfection. 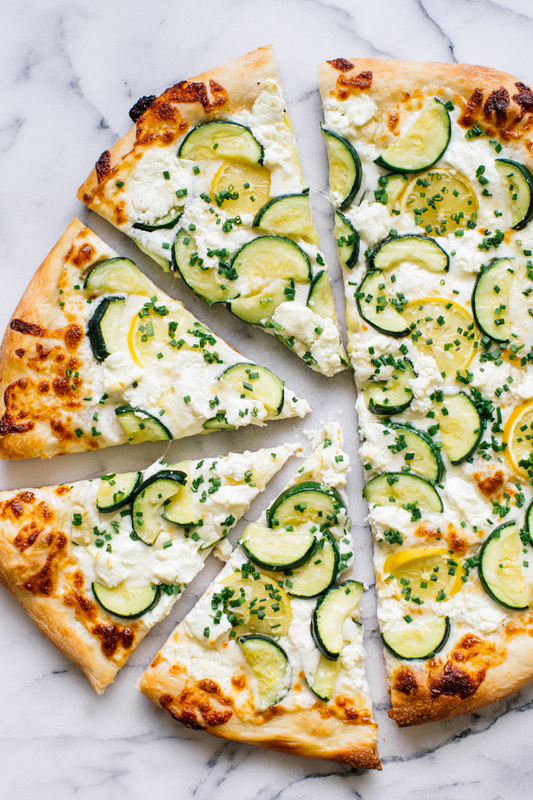 This Zucchini Pizza just screams summer. This lighter recipe features both creamy mozzarella and tang goat cheese to create that signature cheese pull. Atop that are shiny sliced zucchini rounds, lemon slices, and freshly snipped chives. An easy and fresh, yet gourmet, summer supper that can be made in 30 minutes. Peach tarts just might be the dessert of summer. This Streusel Topped Peach Tart takes this quintessential dessert to the next level by adding a rich crumble topping. Tarts are the quick version of pies, and this no-fuss tart crust requires just a press into the pie pan. No rolling out the dough is necessary. Gourmet grilled cheese sandwiches are all the rage. Just when you thought it couldn’t get any wilder, try this Nectarine, Goat Cheese, and Basil Grilled Cheese. Its list of ingredients might be crazy, but the flavor is nothing but is crazy good. What is summer without a big glass of Peach Iced Tea? This version is made with fresh peaches which lend tremendous amounts or pure peach flavor. Kick back and relax with a tall glass of this on a hot day. This Nectarine and Corn Salad with Chipotle Shrimp hits all the flavor notes. It is sweet, spicy, savory, and fresh. This quick dish is a great weeknight meal. It can go from marinade to dinner plate in just about 30 minutes.